We routinely evaluate machined surfaces of castings for one of our clients, looking for evidence of abusive machining or excessive residual stresses. This client came to us with a part that had failed florescent penetrant or eddy current inspection after machining. The rest of the parts in the batch were on the shipping dock ready to go out, but our client needed to know if their machining process caused the defect. If it did, the batch could be in jeopardy. Tasked with identifying the cause of the defect, we got to work. First, the part was examined visually or at low magnification in the area where the indication was observed. In the case of FPI indications, sometimes we can see a surface anomaly that held the penetrant and fluoresced when viewed with black light. In those instances, we are able to section very close to the area of interest and polish right to the surface defect. More often than not though, the indication was found by eddy current inspection and is not visible on the surface of the part. Once we found the defect that we believe caused the indication, we had several ways in which to examine it. 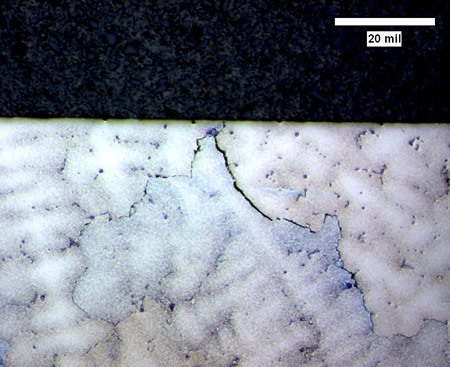 Using an optical microscope, we looked at the as-polished sample first to understand the morphology of the defect. We also etched the sample with a suitable etchant to show the microstructure of the material. Optical microscopy was followed by SEM imaging, EDS element mapping and EBSD to look for internal stresses at the machined surface or along the defect which would indicate plastic deformation from aggressive machining. In this case, we found evidence of abusive machining, probably as a result of a process deviation that went unnoticed or unreported. The examination and evaluation took place within hours of receiving the parts. We were able to help our client find out the cause of the defect and so prevent faulty products being shipped out.